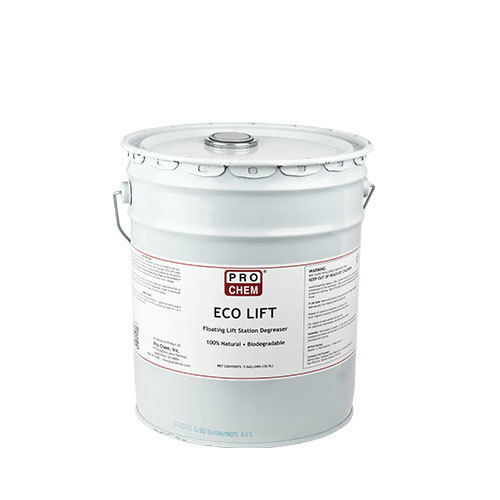 ECO LIFT | Pro Chem, Inc.
ECO LIFT is made from 100% natural ingredients such as d-Limonene and soybean derivatives that keep lift station surfaces free of grease. It coats the walls and surfaces of the lift stations to remove heavy grease accumulations quickly and safely. The special nonemulsifying formula floats on the surface of the water, so it continues to remove deposits as the water level changes. This product contains a soybean oil derivative, which does not evaporate as fast as other solvents. It will remain on the surface of wastewater longer to penetrate fat, grease and dirt, and then strip them away from the surface. Pour ECO LIFT into the lift station. Use approximately 1/2 gallon for every square foot of wastewater surface area. Always maintain a protective layer of 1 to 3 inches of ECO LIFT above water level.